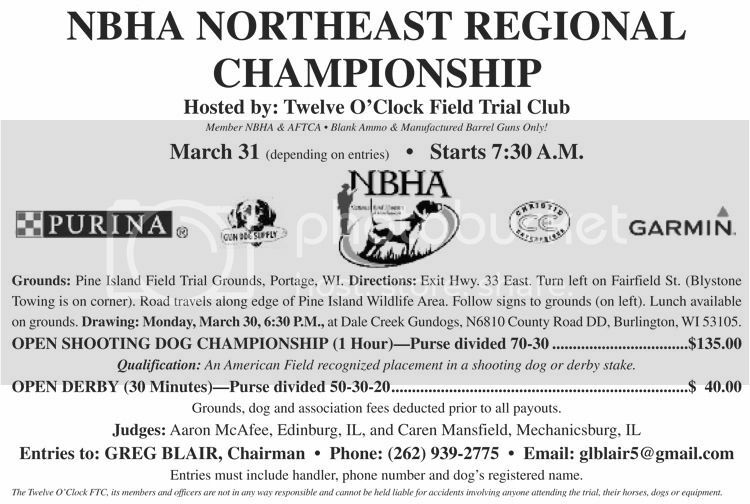 2015 NBHA Northeast Regional CH - March 31-April 4, 2015 Start time will depend on entries. Sounds odd but if you need to escape the snow - COME NORTH! We would love to have you! Email or call with your entries. If you email, I will reply to confirm. If you do not receive a response, it has NOT been confirmed. We have secured lodging a discounted rate at the Day's Inn. Tell them you are associated with the Field Trial at Pine Island. 2 Double beds = $59.99 plus an additional 10% off, if you mention you are part of the field trial at Pine Island. 1 Queen bed = $54.99 plus an additional 10% off, if you mention you are part of the field trial at Pine Island. There is also a Comfort Suites across the street (608) 745-4717. 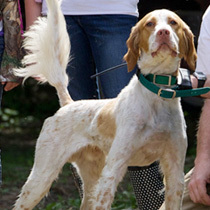 HANDLER/GUEST DINNER: Thursday or Friday evening we will host a handler's dinner (details to follow). We would like to thank all our sponsors Purina, Garmin, Gun Dog Supply, Christie Enterprises, Gundog Central and our local premium vendor Trophy Athletic...which also provides the NBHA National awards. Snow is GONE! Temps are in the mid 50's...come run some dogs! Draw is in roughly 10 days. We would love to have you! We will draw the running order on Monday and I will attempt to post it on Tuesday (if not sooner). Call or email me your entries. Have a great weekend! The draw for our Regional CH is tonight. Contact me before 6pm Central time.